Customers that will be utilizing the transfer stations on a continual basis are required to establish an account with the MCMUA where the account is pre-paid with a required minimum. As you use the transfer stations to dispose of your waste, the cost of the service is automatically calculated and deducted from your account. If you are setting up a new account with the transfer station please use the links below to download and then print the Transfer Station Account Application and Information Packets (PDFs). Notice there is a standard application packet for most haulers and a "homeowner" version of the application packet for those transporting their own self-generated waste. In addition to the applications to setup accounts, there are also corresponding Origin and Destination (O&D) forms for these two types of customers that need to be downloaded, copied and filled out prior to using the transfer stations during each visit. Finally, please download and print the information regarding the list materials mandated to be recycled in Morris County and the inspection program related to these materials. Please realize it is illegal to dispose of mandated recyclable materials. July 2007 letter regarding the transfer station recycling inspection program that is looking for mandated recyclable materials being disposed of at the transfer stations. Click here for information about vehicle and insurance requirements. Around the second week of the month, you will be mailed an account statement detailing the previous months activities including disposal transactions and deposits. You are required to maintain the minimum balance in your account. All accounts with a negative balance at the end of the month will be assessed a 1.5% per month interest fee on the negative balance. Please call us at 973-829-8585 to check on your current balance. As the minimum balance is approached you will need to replenish the account. Checks can either be mailed to our Administrative Offices (214A Center Grove Road, Randolph, NJ 07869) or dropped off in person. See drop-off instructions below. Account checks may be dropped off at the MCMUA's Administrative Offices (214A Center Grove Road, Randolph, NJ 07869) during office hours between 8:30 and 4:30,Monday-Friday. 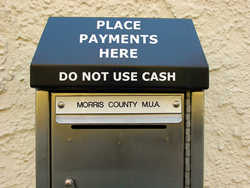 For depositing checks after hours, there is a drop box (see photo) located at the front door entrance of the MCMUA administrative offices at 214A Center Grove Road, Randolph, NJ 07869. Deposit your check in the drop box, and we will credit your account the next business day. Account checks are never accepted at the MCMUA's Parsippany-Troy Hills transfer station. Checks may be dropped off and accepted at the Mt. Olive transfer station if and only if the clerk, Solweig VonMinden, is available to accept them. You must call (973-347-8106) Solweig at the transfer station first and verify she is available to accept your check prior to coming to the transfer station and dropping it off. Her normal working hours are Monday through Friday from 7:30 am to 2:30 pm. If Solweig is not available to accept your check at the Mount Olive transfer station you cannot drop if off there and you will have to either mail or drive it to the Administrative Offices or wait for Solweig to return to the Mount Olive transfer station. Q. What is the cost (tipping fee) to dump garbage at the transfer stations? A. Click here for information on the current tipping fees charged at the MCMUA transfer stations. Q. Do I need an NJDEP decal on my truck to dump garbage? A. State law requires all commercial vehicles and/or vehicles with commercial license plates to have current NJDEP hauling decals on them in order to haul waste and to use the MCMUA transfer station, or any other NJ disposal facility, for that matter. Click here for more information regarding NJDEP decals and registration. The only exception to this NJDEP decal requirement is for residents hauling their own garbage in non-commercial vehicles having a gross vehicle weight under 9,000 lbs. All haulers, businesses, landscapers, contractors, etc. who transport waste to the transfer station must have vehicles with NJDEP decals on them. Q. What are the MCMUA's insurance requirements to use the transfer stations? A. Click here for information on the current insurance requirements to use the transfer stations. Q. Do I need to establish a transfer station account to use the transfer stations? The MCMUA will allow a business to enter three (3) times in a lifetime and pay by check before they are required to open an account. Please utilize this time to start the process of opening an account to meet all MCMUA requirements. If using a check, it cannot be altered or be a temporary check. The transfer stations do not accept cash or credit cards. Residents are not required to set-up a transfer station account unless they find it more convenient. Click here for information about setting up a transfer station account. Haulers with Accounts - Must deposit money in the account and maintain the required minimum balance. The minimum balance will be established individually for each account and will be an estimate of the cost of two average days of disposal. When the account balance falls below the required minimum balance, a company will be denied access to the transfer stations until additional funds are deposited into the account. Additionally, it is suggested that you plan to maintain balances significantly above the minimum to prevent any disruptions in service. Please click here to see your depositing options. Q. Is all garbage generated in Morris County required to be disposed of at the MCMUA transfer stations? ssA. In short, the answer is "Yes." Click here for additional information regarding the waste flow requirements of Morris County and its NJDEP-approved solid waste management plan. Q. Are the loads tipped at the transfer stations inspected? Loads tipped at the transfer stations are inspected for improper materials such as mandated recyclables, hazardous waste, medical waste, and/or liquid waste, etc. If the transfer station inspector writes up a load for containing mandated recyclables, it is likely to be done for educational purposes; violations are rarely pursued if the parties immediately cooperate with Morris County's recycling requirement. Drivers should not give the transfer station floor inspectors a difficult time for writing up issues about certain loads. Any and all cooperation to figure out how not to deliver non-compliant loads is helpful and greatly appreciated. Click here to read a 2007 letter to transfer station customers explaining the inspection process at the transfer stations for improperly dumped recyclables that are mandated to be source separated. Q. Are Leadership in Energy and Environmental Design (L.E.E.D.) certifications provided when disposing of garbage at he MCMUA transfer stations? A. Because the two MCMUA transfer stations are disposal facilities where garbage is delivered for staging to be transferred to landfills for ultimate disposal, there is no materials recovery activity happening to the garbage. As such, the MCMUA does not provide any L.E.E.D certifications with respect to the garbage it accepts at its transfer stations. One should assume all garbage delivered to the transfer stations is ultimately delivered to facilities for disposal. Anyone seeking to recycle waste generated in Morris County must keep recyclable materials separate from the garbage prior to delivering the recyclable material to a recycling facility. You can then assume 100% of your source-separated recyclables are recycled by the recycling facility and that information related to them will be included in reports for L.E.E.D. certification. Morris County's Solid Waste Management Plan requires source separation recycling to be the primary means to separate recyclables from the garbage. Q. Can the public use the scales located at the transfer stations to obtain vehicle weights? The truck scales located at each of the MCMUA transfer stations are only for the use of conducting transfer station businesses. The scales are not available for use by the public unless being used to weigh vehicles to determine the quantity of waste tipped during a transfer station visit. Q. How is garbage collected in Morris County? The MCMUA does not provide garbage collection service for residents. Each town in Morris County is responsible for its own garbage collection system, and the level of service provided by each town varies. 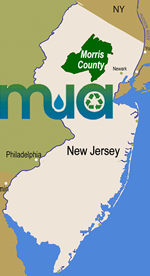 Click here to view the MCMUA's town database of municipal solid waste services provided in Morris County. There are three primary systems of garbage collection in Morris County. Some towns don't provide any garbage collection at all and rely on each resident to subscribe and pay individually for for garbage collection service with a garbage hauler that services the town. Regarding apartments and condominiums, some towns provide for the collection of garbage at the multi-family complexes while others do not. You should check with the manager of the complex to determine how your garbage is collected. The company collecting garbage is often not the same as the entity collecting recyclables. In the towns where the MCMUA collects recyclables, the garbage haulers will always be different. Regardless of who picks up the garbage in each town, all garbage generated in Morris County is required to be disposed of at the MCMUA transfer stations in accordance with the current waste flow requirements of the Morris County Solid Waste Management Plan. Click here for more information regarding waste flow control requirements in Morris County. Q. Can residents use the transfer stations to dispose of their own garbage? Residents are allowed to use the MCMUA transfer station for disposing of their own household garbage providing they comply with all rules and requirements related to safety, vehicles and payment options. Click here to read about these requirements, or call 973-829-8585 to ask any questions. If you call us please stay on the phone with a MCMUA representative for as much time as is needed or read our website well enough to understand all the vehicle and waste material restrictions and limitations regarding using the transfer stations. This will prevent misunderstandings and potentially wasted trips to the transfer stations. Residents do not need to make appointments to use the transfer stations, as they are available to residents complying with the requirements during normal operating hours. Please note that appointments are required to drop off waste at the MCMUA's permanent household hazardous facility, which is located within the Mount Olive transfer station. Q. What forms of payment are accepted for disposing of waste at the transfer stations? Residents - May pay for disposal each time by check without establishing an account or residents can choose to setup a transfer station account to expedite the payment process. Checks cannot be altered or be a temporary check. Additionally, residential transfer station users MUST present a driver's license with their check displaying a Morris County address and the name and address on the driver's license must match what is on the check. The transfer stations do not accept cash or credit cards. Q. Can any truck be used to dispose of waste at the transfer station? Virtually all types of trucks can be used to transport waste to and dump waste at the transfer stations, but most trucks will be required to have NJDEP decals on them to access the transfer station. The only exception to having an NJDEP decal on your truck is if you are delivering your own waste self-generated in your home and the vehicle is registered with Motor Vehicle Commission as having a gross vehicle weight of 9,000 lbs. or less, and the vehicle does not have commercial plates. Important: do not rent a truck from U-Haul, Lowes, Home Depot, Ryder, etc., and expect to be able to use the transfer stations with them. State law requires that all commercial vehicles and/or vehicles with commercial license plates must have current NJDEP hauling decals on them in order to use the transfer stations. Additionally, any truck over 9,000 gross vehicle weight will not be permitted to dump its load at the transfer station if it does not have the appropriate NJDEP decal on it. Click here for more information about NJDEP decal requirements, or call the NJDEP directly at 609-292-7081. In addition, unless the waste you are hauling is self-generated from your own home, you are required to obtain an NJDEP hauling decal to use the transfer stations. This is regardless of the weight of the vehicle. Click here for more information regarding vehicle requirements and rules related to NJDEP decals and registration. Q. Must residents comply with all safety requirement while using the transfer station? There is a lot of heavy machinery operating at the transfer stations and keeping everyone safe is a priority. Residential customers and all other people must comply with all safety requirements while using the transfer station. This includes wearing a hard hat and reflective vest while emptying your vehicle. Hard hats and safety vests will be lent to residents as they are emptying their vehicles. Additionally, it is recommended that no one wears good shoes because they are bound to get dirty at the transfer stations. For more information, click here to read the the transfer station operating procedures. Q. Can tires be dropped off at the transfer stations? Tires are accepted for recycling at the Parsippany-Troy Hills transfer station only. Tires are accepted only on Saturdays. The Mount Olive transfer station is not permitted to accept tires at all. Tires are mandated recyclables in Morris County and cannot be put in the garbage for disposal. Tires are rejected at the transfer stations if found in the garbage. At the Parsippany transfer station, car tires are accepted for a fee of $200.00 per ton, with or without rims. This includes small truck tires such as pickup trucks, vans and SUVs. Small quantities of tires (12 or fewer) are accepted on Saturday mornings at the Parsippany-Troy Hills transfer station without an appointment. For large quantities of tires (more than 12) you must first call the transfer station at (973) 808-9651 to schedule. In addition to the Parsippany transfer station on Saturday mornings, some municipal recycling depots accept tires from residents. Additionally, some private tire recycling facilities operate in New Jersey, typically outside of Morris County. Please contact any facility to confirm drop-off procedures, pricing, etc. prior to delivering tires to them. Click here to view the list of facilities that accept tires.